A resident of Athens, he is Agora Fellow with the American School of Classical Studies in Athens. 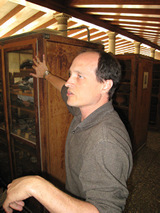 He has spent ten seasons excavating in the Athenian agora and is the supervisor of the excavation of the Painted Stoa. He studied and has earned advanced degrees in architecture and archaeology in Rome and in The United States. 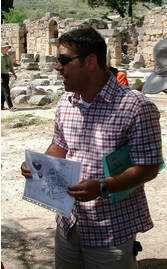 He teaches classical history and leads seminars in archaeology and architecture in Athens, Corinth and Italy. A resident of Athens, he is an archeologist with the American School of Classical Studies in Athens. He received his M.A. in art history from Vanderbilt University and his Ph.D. in classical art history and archaeology from the University of Athens. He teaches classical history, archaeology and art history and leads seminars in archaeology in Athens, Corinth and Turkey. He is the recipient of numerous scholarly awards and has published extensively. A resident of Istanbul, Ali has a B.A. 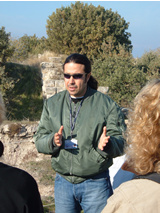 in archaeology from the University of Istanbul and an M.F.A. in film making from the University of Southern California. He specializes in the history of the Ottomon Empire and the formation of the Turkish Republic. A professor of theological bibliography at Claremont School of theology who holds a Ph.D. in New Testament Studies from Southern Methodist University. He is the author of several books, including Paul, His Letters and Acts (2010) and Reading Acts in Diverse Frames of Reference (2009). He was the lead translator for the Gospel of Luke in the Common English Bible. He has been leading journeys to Israel-Palestine, Jordan, Egypt, Greece and Turkey since 2000. A resident of Athens, she is a classical studies specialist who has studied at the National University of Athens. Her expertise includes ancient Greek history, literature, archaeology and mythology. 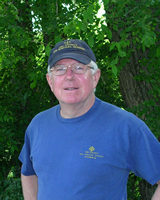 A member of the Minnesota Annual Conference of the United Methodist Church, Ric has served churches for thirty years. He has a particular interest in mission in the Holy Land, having lead and participated in numerous mission projects there. He leads pilgrimages throughout the Middle East, especially in Israel-Palestine. Bert is a United Methodist pastor and a pastoral counselor. He leads programs in Israel, Palestine and Jordan. He has a special interest in historical Jesus studies and he writes articles and essays for many journals. He is the author of a book, Jesus Unplugged (Faithwalk Publishing, 2005). Bert brings his special interest in nature, especially birds of the Holy Land, to his teaching. Jesper leads pilgrimages in Italy and Greece. From Copenhagen, Denmark, Jesper has earned advanced degrees in archaeology and art history. He discovered and excavated the temple of Asclepius on the south slope of the Acropolis in Athens. He is the co-author of a book, Religion and Material Culture: Defining Religion, Religious Elements and Cutlural Memory on the Basis of Objects, Architecture and Space. He is a doctoral candidate at the University of Denmark. Founder of Clergy for Peace and current Field Director of Rabbis for Human Rights, two Jerusalem based peace organizations. Rabbi Milgrom will direct our inter-religious studies programs. He is an ordained Conservative Rabbi. Duncan is a Permanent Deacon in the Catholic Church. He is honorary research fellow at the University of Wales Lampeter and was Principal Lecturer in Theology and Religious Studies at St. Mary's University College where he taught for 33 years. His doctorate is from the Aquinas Institute in Saint Louis, Missouri. Publications include The Pilgrim Preacher: Palestine, Pilgrimage and Preaching, (London: Melisende, 2004 and 2008). Also the founder and Executive Director of The Society for Biblical Studies, he earned his M.Div. from Union Theological Seminary (New York City), a Th.M. from Harvard Divinity School and an S.T.M. from Boston University School of Theology. He is an ordained United Methodist minister and served local churches for ten years. 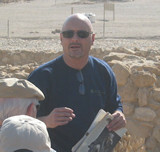 He has worked in Jerusalem for 19 years as a United Methodist missionary and as a teacher. He teaches biblical studies, mission, and contemporary studies, pastoral studies. He is the author of a book, The Word of God and the World of the Bible: An Introduction to the Cultural Backgrounds of the New Testament. (London: Melisende, 2001).